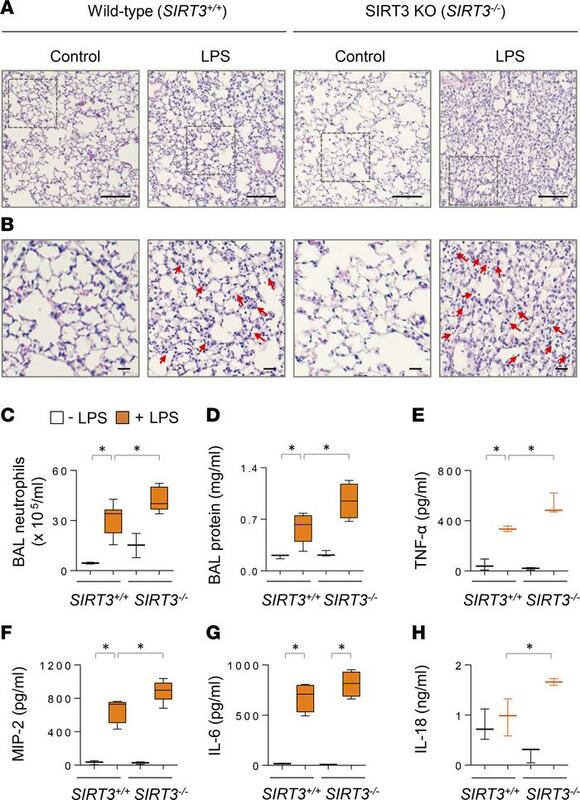 SIRT3 deficiency exacerbates inflammation in lungs of LPS-treated mice. (A and B) Representative images show H&E staining of lung sections from SIRT3+/+ and SIRT3–/– mice. Mice were subjected to saline (control, i.t.) or LPS (3 mg/kg, i.t.) for 24 hours. Scale bars: 100 μm. Lower panel showing regions of images indicated by dashed boxes. Red arrows indicate areas of injury, including alveolar spaces filled with a mononuclear/neutrophilic infiltrates, cellular debris, and proteinaceous material. (C–H) The total number of neutrophils (C), protein content (D), and proinflammatory cytokines (E–H) in BAL fluids of indicated groups of mice. Data presented as mean ± SD (n = 3–5). *P < 0.05 (ANOVA).